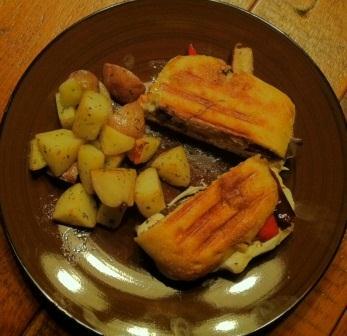 Tonight, I didn’t have much time to make dinner so I made veggie paninis with a roasted red potatoes. It was very easy, inexpensive and healthy. The best part though, is that it tasted great. My husband and I received the Cuisinart Griddler as a gift and it is GREAT for making paninis so I used it to make tonight’s dinner. For the paninis, I sauteed 1 red pepper that I sliced lengthwise into pieces about 1 inch in width in about a tbsp of extra virgin olive oil (EVOO) over medium heat – make sure to sprinkle it with a little kosher salt as you saute. When those were starting to get soft (after 3-5 minutes), I added 2 portobello mushrooms that I sliced lengthwise into pieces about 1 inch in width and sauteed those until they were soft and starting to sweat. I had 2 ciabatta rolls that I sliced and I put a TINY bit of butter on the outside of each of the slices. I then assemble the paninis by placing the first half of the ciabatta roll on the griddler, butter side down, add a few slices of mozzarella for the first layer, add slices of the sauteed portobello for the second layer, add the slices of sauteed red pepper for the third layer and then top with the other half of the roll, butter side up (sometimes, before topping the panini, I add a drizzle of balsamic vinegar and/or a sprinkle of dried oregano). Close the panini press and let it work its magic for about 5 minutes or until the mozz has melted. Make sure to start the potatoes first because they take a little longer. First preheat the over to 425 degrees. After you wash and dry the potatoes (you could use red or yukon gold), slice them into about 2 inch chunks and toss with 1-2 tbsp of EVOO, pinch of kosher salt, pepper, crushed red pepper flakes, dried parsley, garlic salt, and juice from half a lemon. Then transfer onto a cookie sheet and bake for about 25 minutes. I like to take mine out a couple of times and toss them around to make sure that they’re cooking evenly. You’ll know that they’re done when they are starting to brown and fork-tender.